with the Goldens but instead opted for a quick paddle around the stage where the river has risen past part of its platform. After a dip we headed toward one of Joey’s favorite restaraunts, Does Eat Place where he is mesmorized by a case full of steaks! 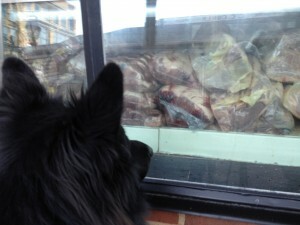 Wonder what he thinks when we pass this location on our daily walks ??? Stopping by Shultz Park on our way home we snap a picture from our favorite bench where Mr. Bob proposed to his beautiful bride. Makes us smile. Later that day it was Maggie’s turn for a walk and quick picture from this same location. Don’t forget that if you walk one dog you MUST walk all five dogs. Three Whippets in a neighborhood full of squirrels provides quite the entertainment. Their scream make those who don’t know us appear as if we are being cruel. Our three sighthounds can get very vocal ! 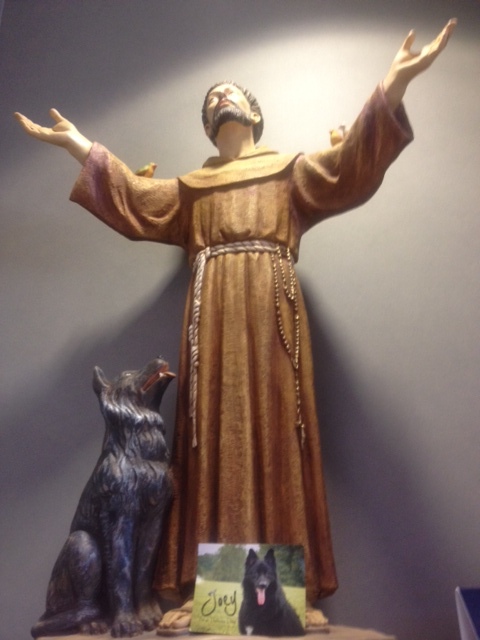 Finally we found this is great looking St. Francis statue at St Francis Hosptial in Cap Girardeau, Mo. that appears to have Joey by his side. We left Joey’s Therapy Dog card at the base and on our return visit for Bob’s back surgery weeks later, behold Joey’s card is still there ! God boy Joey! Good girl Maggie and good girls Nellie, Sophie Sue and Zoomie too! ← Previous Previous post: Joey visits his friends in uniform! Copyright © 2019 River Crest Shilohs. All Rights Reserved.